So you want to lead major change in your business, education, government, or volunteer organization. 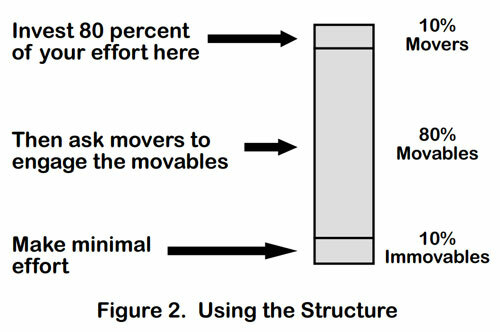 Then consider putting members of your organization or group into one of the three categories illustrated in Figure 1, that is, the movers, the movables, and the immovables (Walesh 2012). 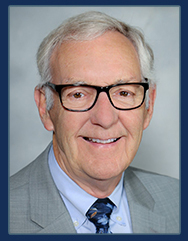 The movers, comprising roughly ten percent, are predisposed to change and to leading change. Look for them. You confidently identify these individuals as supportive of the change and co-leaders of it. The movables, the large approximately eighty percent component, are predisposed to follow. They can be convinced of the need for change. 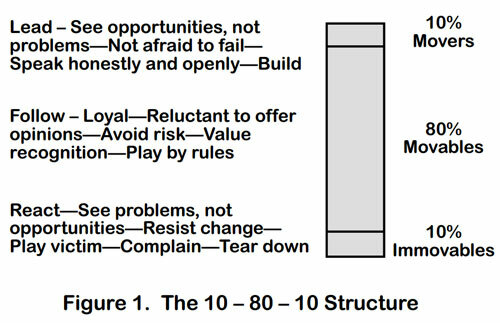 Having established, at least for discussion purposes, a way to view an organization in which you and others want to lead change, move forward as shown in Figure 2, by devoting most of your efforts -- say eighty percent -- to communicating your vision or goal and initial strategy and tactics to the movers. Ask them to thoughtfully consider your ideas, refine them, and hopefully, in principle, accept them. This could require a major effort by you and them and considerable elapsed time. However, in engaging the movers you are working with forward-looking individuals like you. Consider another way of explaining the process by which you, the advocate of change, should focus first on movers and then, if successful, have them focus on the movables. Communicate the issue, the problem, or the opportunity to the movers and explain how the change you are advocating will resolve the issue, solve the problem, or seize the opportunity. We are tempted in situations like this, because of efficiency considerations, to go exclusively or mostly with mass communication such as e-mails, newsletters, memoranda, posters, banners, coffee mugs, key chains, and wallet-size cards. Don’t go with mass communication—other than as a supplemental measure. Mass communication is not an efficient use of your time and energy. Instead, go one-on-one and one-on-small groups and focus on that ten percent -- the movers (Smart 2007). Then you and the movers can engage the movables and effect change. Annunzio, S. with J. Liesse. 2001. eLeadership: Proven Techniques for Creating an Environment of Speed and Flexibility in the Digital Economy. The Free Press: New York, NY. Smart, G. 2007. “Strategic Planning in 5 Relatively Easy Steps.” Education Session, NSPE 2007 Annual Conference, Denver, CO, July. Walesh, S. G. 2012. Engineering Your Future: The Professional Practice of Engineering-Third Edition, Chapter 15, “The Future and You,” Wiley & Sons: Hoboken, NJ.